fabulous kissable lips… with LipSense, of course. it’s all about Red & Pink…and your added flare! Red LipSense:Â Blu Red (Christina Aguilera’s Favorite Lipstick), Cranberry (Christina’s other top pick) or the newest Crimson Red LipSense which is a one of my new staples because it is so sassy and interestingly retro. Valentines Day is so worthy of Bold & Fabulous! You might want to jazzÂ it up with a New Red LipSense! Then add some special Glam for the evening of FUN by creating that perfect Pout! 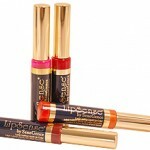 Use a touch of Rose Ice Lipsense on the middle of your bottom lip and top that off with a dash of Pink Glitter Gloss. Yummy! and pretty. Do you need some assistance choosing the right shades of LipSense? I love making recommendations and have made many happy customers by doing so. Please don’t hesitate to email or call to ask for help. Here’s the fine print…This Lipsense discounted special ends February 14th, 2011 at usual Pumpkin time CST. In the notes section of your order, please specify which gloss you prefer. Only 1 Free offer per order. Please feel free to place your order by phone.Â I also take Paypal if you would prefer to use that form of payment.